A high capacity battery pack with solar and mains charging providing long term 12 Volt power for field applications, specifically T24-RDC remote data collection device. The power pack 1 & solar panel 1 PP1 & SP1, provides dependable off-grid power generation to support a variety of Mantracourt products. 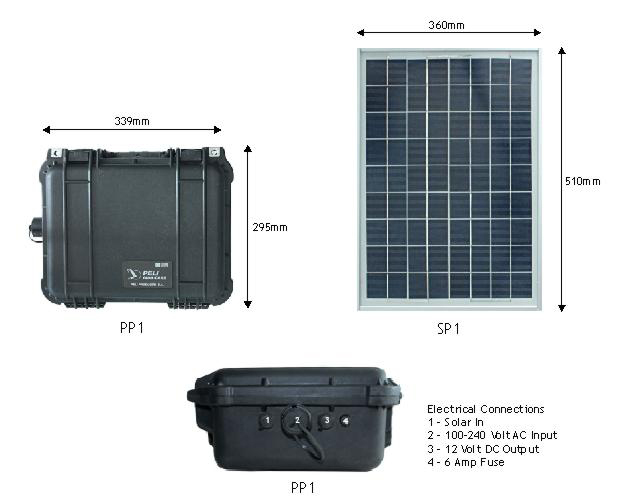 Packaged in an IP65 / NEMA 4 sealed case with rugged waterproof connectors the PP1 has two sources of charge for the internal battery with both solar and mains power input charging. The case also features stainless steel padlock protectors for easily securing your supply on site. The PP1 has a single 12 Volt fuse protected output. The mating connector comes pre-fitted with 5 metres of cable and bare end connections. The SP1 solar panel features hail-proof tempered glass and closely packed polycrystalline cells, sealed into a robust aluminium frame. The junction box on the rear of the panel does not protrude beyond the frame, so installation can be simple and neat. The solar cell comes with 3 metres of cable as standard longer lengths are available on request. The SP1 & PP1 combined are designed to provide a perpetual power supply for a 12 V system drawing an average of 53 mA, even during winter. The PP1 power pack 1, can also be used as a mains 12 V DC supply with battery back up. Q: On The PP1 & SP1 what is the recommended positioning of the SP1 Solar Panel? A: It should always face true south if you are in the Northern hemisphere or true north if you are in the Southern hemisphere. True north is not the same as magnetic north. If you are using a compass to orient your panels, you need to correct for the difference, which varies with location. Search the web for “magnetic declination” to find the correction for your location. Also consider where shadows may fall on the solar panel, the panel needs maximum exposure to the sun to operate as specified.